As you might have guessed, data is displayed in a table. Table visualizations are perhaps most useful when you need to present a large number of data points, and when the actual value of those data points is important (e.g., it’s not enough to know that the March registration numbers exceed the February numbers, you need to know how much those numbers changed.) Tables are good at reporting large quantities of data but are not as well-suited at reporting data trends: it can be difficult to look at a table of numbers of immediately grasp whether registrations have generally been increasing or decreasing. Each of the tabs on this menu, and each configuration option found on those tabs, is detailed in the next few sections of this documentation. This option applies only to tables that actually use column totals. 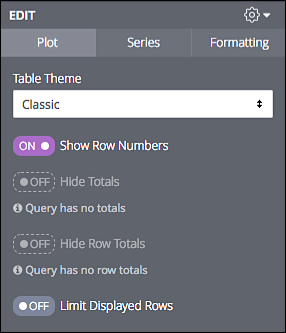 This option applies only to tables that use row totals. The first list (Show) specifies whether you want to hide or to show the designated rows. If you choose the hide the rows, all the rows in the table except the selected rows will be displayed. 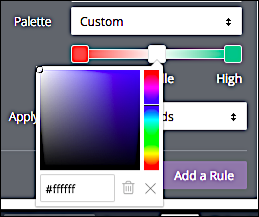 If you choose to show the rows, only the selected rows will be displayed. Applies conditional formatting to the visualization: individual table cells are colored based on their value (for example, high values are shown with a green background). Include Totals. When set to On, the selected color scheme is applied to row or column totals displayed in the table. When set to Off, totals are excluded from color coding. Format. Specifies the scale used for color coding. You can use a sliding scale (from low to high or from high to low), or apply the scheme to specific values (e.g., numbers greater than 100, or numbers between 1,000 and 5,000).